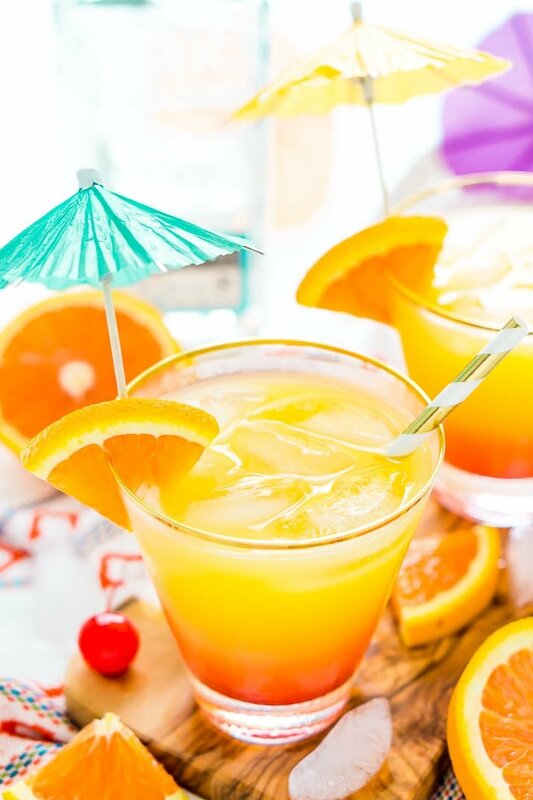 The Tequila Sunrise is an easy, classic cocktail made with zesty orange juice, refreshing tequila, and sweet grenadine. Perfect for hot summer nights and get-togethers! 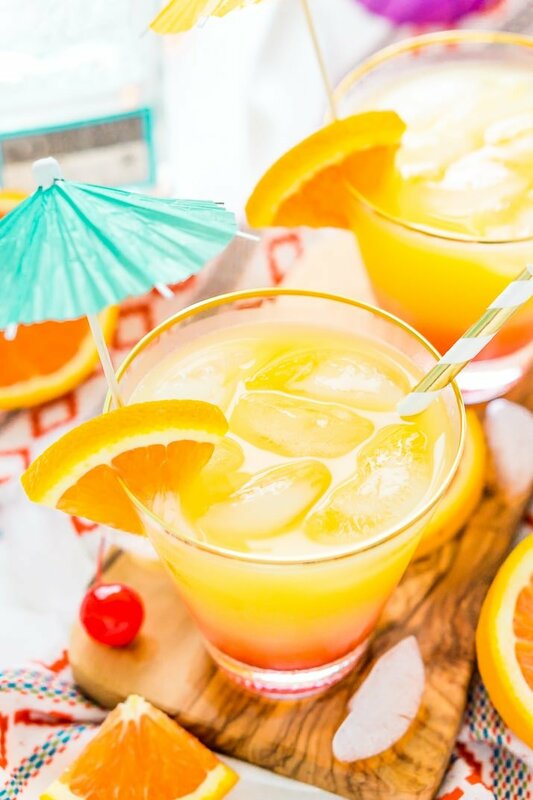 Sweet, simple, and beautiful in a glass, Tequila Sunrise drinks are the perfect thing to get the party started this summer! There are so many reasons to love this classic cocktail, the first being its citrusy, fruity flavor. This is a wonderful recipe for beginner tequila drinkers, as well as people who are already fans of the spirit. Speaking of grenadine, have you ever tried making it from scratch? This homemade grenadine syrup is easy to make, all-natural, and a total game-changer in mixed drink recipes! Tequila Sunrise cocktails look like summer in a glass with layers of red, pink, and orange. As simple as they are to make, these yummy drinks look gorgeous on a tray or in a photo for your Instagram feed! And don’t forget the garnishes! For a tropical touch, decorate these delicious drinks with orange slices, maraschino cherries, and colorful straws — bonus points for plastic swords and mini umbrellas! Every time I plan a backyard barbecue, I love serving a signature cocktail in addition to bottles of wine and cans of beer. 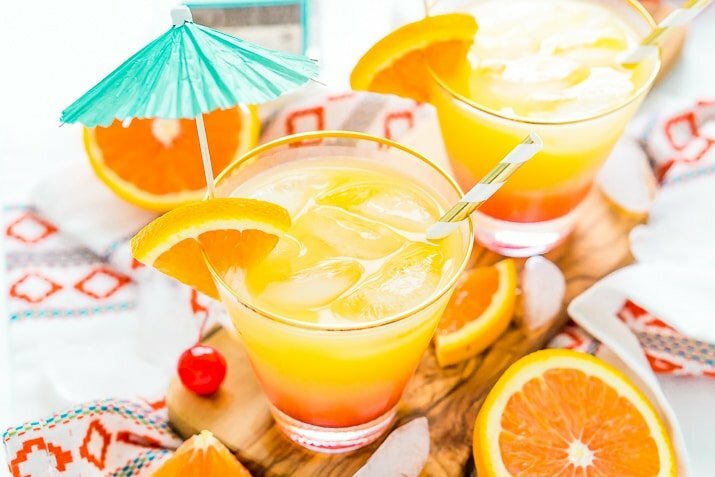 With its summer sky-inspired colors, this three-ingredient Tequila Sunrise recipe is perfect to serve your adult guests. Of course, if the kiddos want something special to sip, just pour some orange juice and grenadine over ice for a simple mocktail. And don’t forget the cherries! 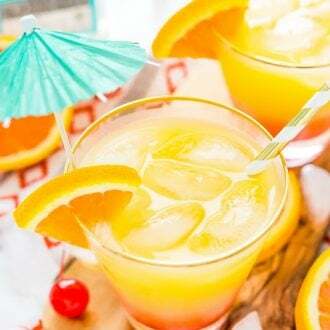 If you’re looking for a simple, refreshing cocktail to get the party started — and keep it going as the sun goes down — try making a batch of Tequila Sunrise drinks. They may become your new go-to beverage for all your summertime get-togethers! When Was the Tequila Sunrise Invented? It depends on which version you’re talking about. The more popular and modern version, which is this recipe, originated in the 1970s in California, but there was an earlier version made with tequila, crème de cassis, lime juice and soda water that came out of Arizona. Pin this Tequila Cocktail for Later! Add ice to a tall glass and set aside. Add 1 cup of ice to a cocktail shaker along with the tequila and orange juice, shake a strain into a tall glass. Slowly pour in the grenadine and allow it to settle at the bottom. Garnish with an orange slice and maraschino cherry, stir before drinking. Oh my goodness, this looks amazing! 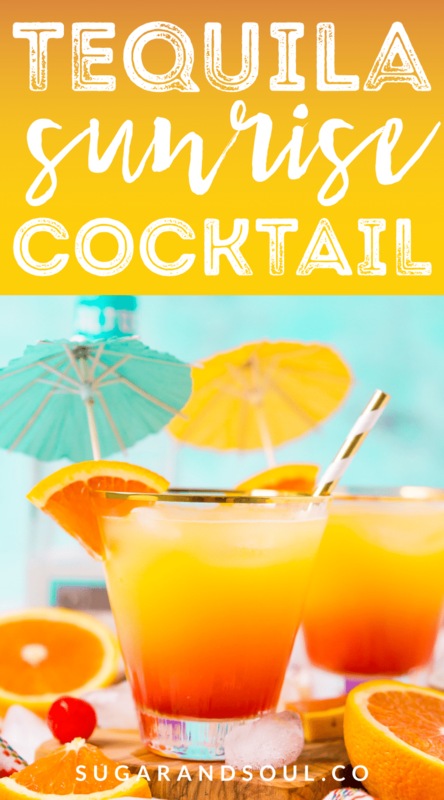 The perfect cocktail to sip on this summer! It sure is and super easy to make too! Oh yes. Yes. Yes. Yes. This is my kind of cocktail.